Professor Charles Zika, Chief Investigator in the Change Program will convene a symposium and public lecture by Lyndal Roper, an alumna of the University of Melbourne and the first woman to be appointed Regius Professor of History at Oxford University. We currently recognise that emotions are historically contingent, shaped by cultural scripts that teach people how to feel and the appropriate way to display such feelings. At the same time, for the eighteenth century, the sense that the emotional is something personal has led to a focus on letters, diaries and personal testimonies to access people’s cultural worlds. As an era with low levels of literacy and poor surviving records for the lower classes, this has led historians to focus on the social elite. This paper will explore how we might access the emotional world of the lower-classes during such periods, using two main methodological approaches. The first is using the oral culture left by such groups and the second is using a spatial analysis of descriptions of their everyday behaviours that survive in crime records and travel writings. In particular, it will ask how such sources help uncover intimacy within the family, how different approaches and sources shape our understanding of intimacy in particular contexts, and how intimacy operated amongst the Scottish lower classes. To enable this discussion, it will include some thoughts on what intimacy is, how it functions, and how it means different things during different periods. This paper explores the challenges of interpreting emotions associated and generated by premodern religious objects as they are now curated in modern museum and gallery environment. How are premodern emotions explored and interpreted for modern audiences through objects, and what is the role of the historian in this process? Are our methods useful and/or appropriate for these narrative and interpretive contexts? Indeed, what methods make most sense for interpreting emotions through material objects? Here, the focus will be specifically religious objects which have some particular issues of their own. In my paper I explore how wonder, fear, fury, love and loyalty feature in two areas where historians have tended to look at the policing rather than the expressing of emotions: maritime and trade history. I shall also consider how we can plot the role of women and family into the emotional cartography of these traditionally masculine areas. The focus of my discussion will be Sebastian Cabot’s 1526 voyage from Seville to the Rio de la Plata. This voyage took place at a pivotal time in maritime and trade history: when New World ‘discoveries’ and burgeoning Atlantic trade meant that men were at sea for long periods. This meant that the display of emotions and attempts to police them on board ship were undergoing a major shift at the same time as many women in port cities, like Seville, were struggling to maintain their families, businesses and reputations in the absence of their menfolk. This paper begins the outline of a new project to investigate journeys into the unconscious in the early modern era in Western Europe. Phenomena now referred to as ‘altered states’ were in the early modern period not just the province of an individual’s behaviour: they were also shared places of remove, sacred or damned locations which were accessed through a diverse range of rituals. In prayer, in trance and in ecstasy, in legal torture and in the torture of exorcism, in shared myths of visits to the world of the dead, in acts of divination, in the transports resulting from the act of reading, and in the ritual exigencies of legal cases which gave rise to imagined knowledge about the witches’ Sabbath, the ‘worlds behind the world’ of the everyday provided a vast mindscape of moral resources for the experience and governance of emotion in diverse early modern communities. This project investigates the politics and ritual entailed in access to those (at once) psychic, cosmic and moral spaces. It is less a project about new materials than about the rereading of familiar materials, using a cultural history approach that focuses on the ritual means of access to inner and outer worlds. Massacres of unarmed civilians during the 1641 rebellion in Ireland were some of the most notorious events in a very troubled century. Reports of ghostly apparitions, tainted fish, bloodied water and other supernatural happenings marked many of these sites and circulated widely in Ireland and England. Witnesses interpreted these apparitions using a vocabulary of emotion that enabled them to reconceptualise the places where the events occurred. By embedding emotional meaning into massacre narratives, secular spaces such as rivers and bridges were invested with connections with the sacred and otherworldly. The ars praedicandi counselled that preachers aim to move hearers as much as to instruct and persuade them. This paper considers not just the analytical categories pursued by preachers that might relate to emotion, but also the perceived impact of preachers on their audience. Some broad implications about changes of perception across the fifteenth century will also be explored. This paper will investigate the rise of an ‘emotional public’ around the idealized affective family, and assess its influence in law and government. In eighteenth-century England middleclass habits of consumption and sensibility gave rise to the novel and caused the rapid development of the newspaper press. In this context it is possible that newspaper-led moral panics about the city that were constituted around crime and other forms of ‘deviant’ behaviour generally assisted in the ‘emotionalisation’ of the affective family and its vulnerability as a central and sacred element of bourgeois public opinion. Reportage of this kind was also amplified because breaches of ideal family behaviour exercised a powerful fascination in the commercial marketplace of print, where they could be consumed safely. These experiences and impressions therefore appeared to be principal drivers of emotional development in the public sphere. This complex reading of cultural reproduction around emotional expression raises important and creative questions about changes in government. It is evident from the substance of the reportage and commentary about eighteenth-century criminal justice and disorder that governments and legislatures were expected to address ‘social problems’ which were constituted by emotional discussions in the newspapers and other press media, and to marginalize the deviant groups by strong measures of sovereign authority. Indeed, sensitivity to public anxiety and the willingness to address it with symbolic gestures of authority is a hallmark of modern governance, for politics has been aptly described as ‘the process by which the irrational bases of society are brought out into the open’. Habermasian thinking about the public sphere would suggest that such a powerful public discourse as that generated by threats to the family should have considerable influence on policy and decision-making in parliament, the council, and the courts. On 14 June 1645, Naseby-Field in Northamptonshire proved to be a pivotal battle in the civil wars. The decisive rout of the King, Prince Rupert, and the Royalist forces by Sir Thomas Fairfax, Oliver Cromwell and the New Model Army of the Parliament resulted in the deaths of over 1000 Royalists troops, 150 Parliamentary troops, and the slaughter of over 100 women in the Royalist baggage train. The turf of Naseby battlefield was soaked with the blood of men and women whose bodies formed the tangible tangled and dismembered evidence of an irrevocable political and religious divide. Overnight Naseby became a site of spilt blood, pilgrimage, memory and amnesia. In the twenty-first century the annual commemoration of this battle continues to attract pilgrims who place their ephemeral floral tributes, to regiments and fallen soldiers, but not the women of the baggage train, reverently against the two surviving battlefield monuments. Polarised memories of the civil wars combatants and non-combatants persist, but the commemoration is a gender specific practice. This paper will present the directions for future research on the Cathedral of Notre Dame at Chartres in the context of the medieval emotional experience of sacred sites. The research will consider the contemporary experience of the built environment of the Cathedral, particularly the ways in which different groups of people occupied and moved through and around its various physical spaces. It will also examine the visual program of the Cathedral and its role in evoking and depicting emotion. The interaction of pilgrims with the relics and objects of devotion on which the Cathedral’s fame rested will also be discussed, in particular the ‘afterlife’ of the relics in pilgrim badges and replicas, and the evidence they provide for the translation of the monumental to the personal. In the wake of the Reformation, visitors to English church monuments were no longer exhorted to pray for the dead. Yet monuments continued to speak to the living about grief, death, fear, and hope. What emotional responses, if any, did monuments seek to elicit? Was the act of remembering itself an emotional response, and if not, why not? During the Popish Plot, there was a spate of house fires in London, apparently instigated by domestic servants in the pay of Catholics. 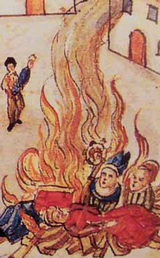 Fire was not an uncommon event in early modern urban areas where wooden buildings were crowded into narrow streets. Conflagration and the destruction of houses and neighbourhoods posed a very real danger and therefore constituted a legitimate source of anxiety. Yet Londoners, like the residents of other European towns and cities, did not often construe destructive fires as accidental. Rather they deemed them to be the work of arsonists in the pay of sinister overlords who sought the destruction of towns and their inhabitants. Thus, foreigners, vagrants and other marginal groups were accused of incendiarism across Europe. This paper will consider the London fires as symptomatic of the anti-Catholic fear sweeping England in the 1670s and 1680s. Already blamed for the Great Fire of 1666, and deemed capable of murdering Protestants and overthrowing the English Church and State, the ready association of papists with house fires is seemingly yet another instance of the anti-Catholic paranoia which was being played out in the Popish plot itself. But how do we understand and explain this fear? To what extent was it ‘manufactured’ by the Protestant authorities, and to what extent did the Catholics generate and sustain it? But is it also useful to consider the London fires within the wider context of fears about arson conspiracies in continental Europe, rather than considering them as something peculiar to England in the 1670s? Christian fear-mongering has become a cliché́ among the religion’s critics, with influential commentaries ranging from Nietzsche’s Beyond Good and Evil to Oskar Pfister’s Christianity and Fear. Yet while the critics capture the extent of social manipulation and control enabled by the orthodoxy’s hold on this basic emotion, they seldom pay attention to the variation among Christian representations of fear or to the empowerment its cultivation promises to deliver. In my talk I will explore three nodes and three centuries in the history of cultivation of fear represented by Anselm of Canterbury (1033- 1109), Alexander Neckam (1157-1217) and the anonymous compiler of the Speculum morale (c. 1320). My aim will be to examine the mechanisms of emotional and social control offered by a conscious cultivation of fear, with a view of refining a useful framework for the study of medieval emotions from today’s perspective. This symposium aims to explore the role of emotions in historical change, and more specifically, the way particular emotions may have impacted on or even driven major changes in Europe in the medieval and early modern period. Historians have long explored the processes by which certain thoughts are transformed into action, how ideas become movements, how individual aspirations and collective movements become strategies for change. Historians have ascribed these processes to the power of ideas, to the strains and defence of social structure, to the fundamental impact of material conditions, to the dynamics of psychic development. Only recently have they begun to ascribe a role to emotions – experiences linked to the constraints of the body and physiology, on the one hand, and also complex, if loosely articulated and not always intelligible mechanisms for the realisation of thought processes, on the other. While general questions about emotions and historical change are critical, historians are generally more interested in how particular emotions or bundles of emotion operate in specific historical situations. For we only know of emotions in the past from the way historical actors describe or allude to them. Their operation cannot be divorced from their articulation. So where do we find emotions in the past? What significance should we ascribe to an increasing consciousness of emotions? How did people in the pre-modern past learn to recognise, exploit or control emotion? What models did they use to support such claims, and how did they transmit and reproduce them? Why do we tend to relate emotions to change, rather than to continuity? And what of memory? Do particular events promote emotional responses through memory, or are the emotions of individuals and groups the critical factor? Do different historical periods promote particular emotions, like fear or envy; and if so, what historical meaning might this have for our understanding of that past? These are a few of the questions and problems that this symposium might begin to address through the study of particular phenomena and events in pre-modern Europe. The Reformation was a theological and intellectual movement, but it was also profoundly emotional. Luther’s unbearable fear and despair as a monk was what impelled him to understand God’s justice differently. Anger was central to Luther’s creativity - time and again, he reached new intellectual insights through attacking father figures. Envy, too, played its part, and in his letters Luther constantly attributes envy to others. And when clerical celibacy was abolished and priests began to marry, a host of complex sexual emotions were unleashed. This lecture explores how we can understand the Reformation differently by exploring its emotional dynamics. 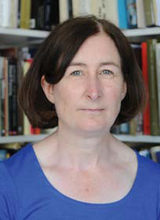 Lyndal Roper is Professor of Early Modern History at the University of Oxford and editor of the premier historical journal, Past and Present. She has recently been appointed Regius Professor of History at Oxford - the first woman and the first Australian to be appointed to this prestigious chair. Professor Roper works primarily in the field of gender history and the religious and social history of early modern Germany. Her publications have focused on issues of gender, witchcraft, the body, dreams and fantasy. Her forthcoming book is Witchcraft and the Western Imagination (University of Virginia Press) and she is now working on a biography of Martin Luther. Lyndal Roper is an alumna of the University of Melbourne.